Prepping for back to school gives me an excuse to embellish a little in the school supply department. Honestly, organizing school supplies with my little guy make me quite happy. We’ve been a little obsessed lately finding and identifying the colorful rainbows in many of our back to school supplies. Many of which we have displayed in organizers and containers. 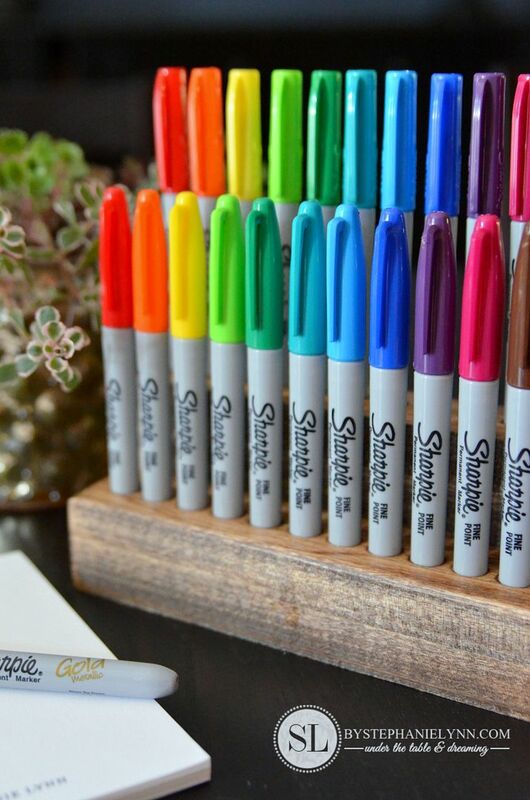 The Sharpies however – we thought they needed something a little special. 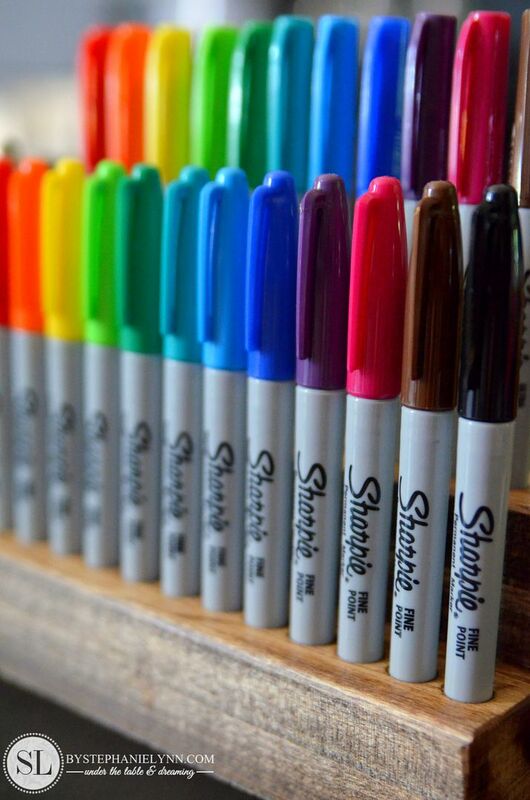 Sharpies get used a lot around here – projects, crafts, labels – they are one of our favorites. Plus they can be found in every color under the sun. 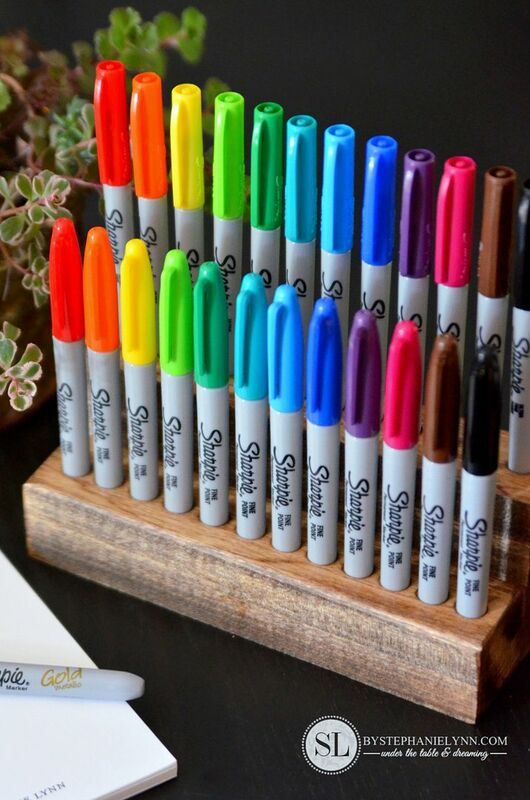 We put together this Wooden Sharpie Holder to not only showcase the beautiful rainbow display but to organize the markers and keep them within arm’s reach. 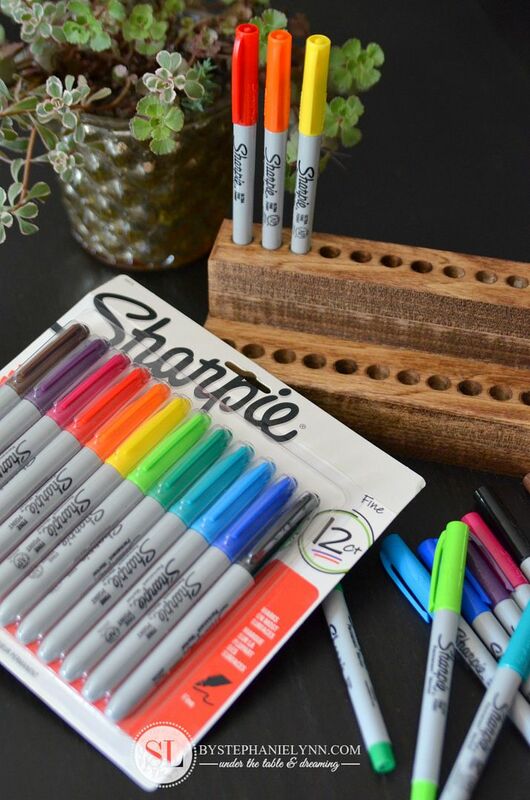 For just a few dollars in supplies – we think it makes a great gift idea too! Step One: Cut three 8 inch pieces from the 2 x 2 Poplar board. Step Two: Measure and mark drilling guidelines. 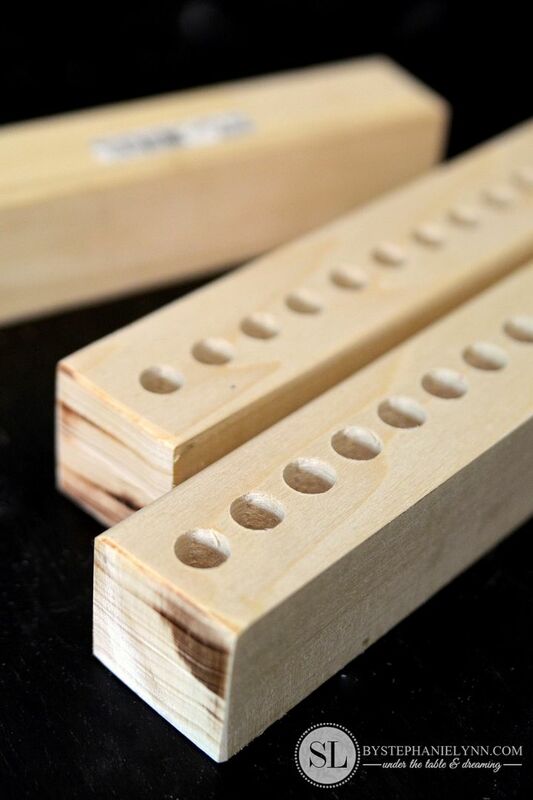 Start with one guideline down the center – then mark off every 5/8 inches for the holes, as shown above. Draw the guidelines on two (out of the three) pieces of the poplar. 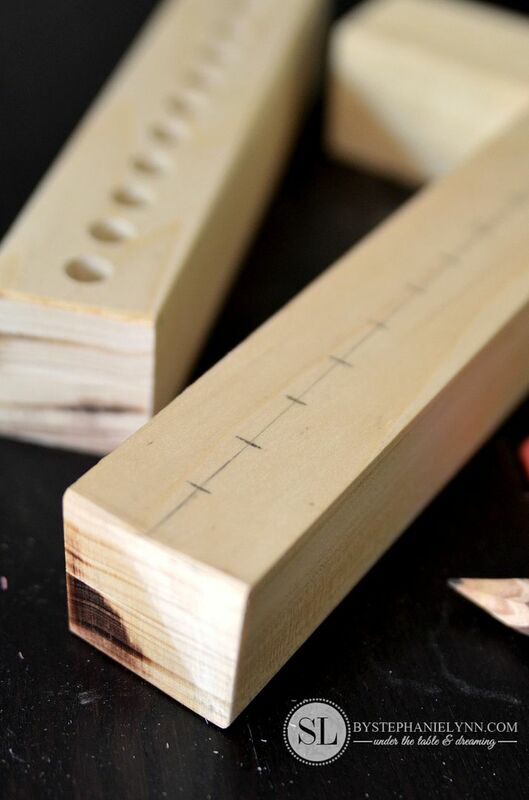 There should be a total of 12 marks for the holes on each piece of poplar. Step Three: Drill the holes & sand. The 7/16 Drill Bit will be used for the Fine Markers and the 27/64 will be used for the Ultra Fine. 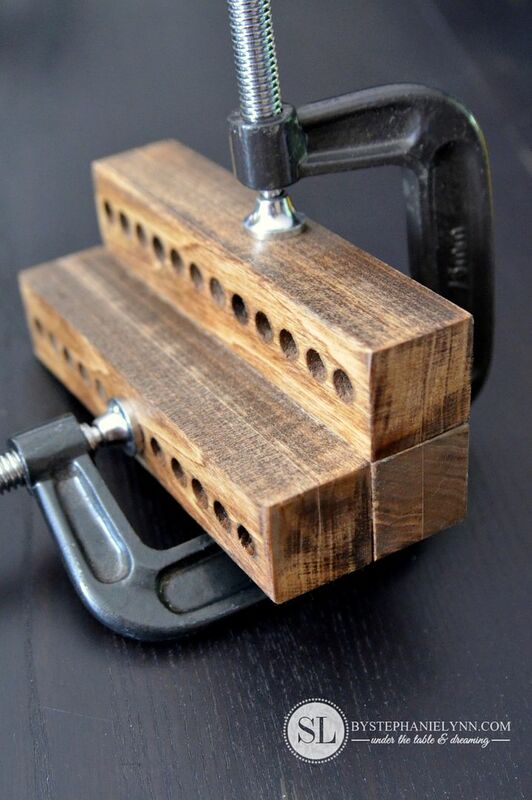 A drill press is much easier to use for this process for accuracy and consistency – however the wood can be clamped down and drilled using a hand drill as well. If you follow along on instagram – our little guy really loved helping with this part. Once all of the holes are complete sand smooth. Step Four: Stain or paint. 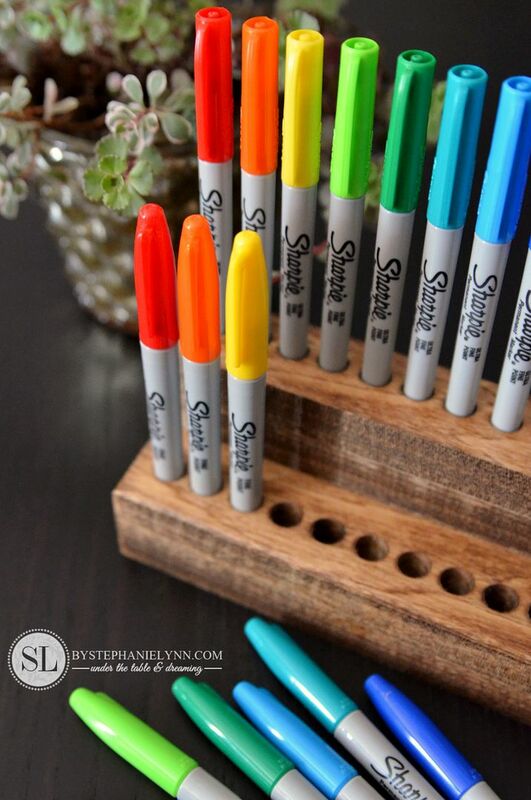 A walnut stain was used on the wooden sharpie holder above to showcase the poplar wood grain. Let each piece completely dry. Tip: Be sure to stain the pieces prior to assembly. 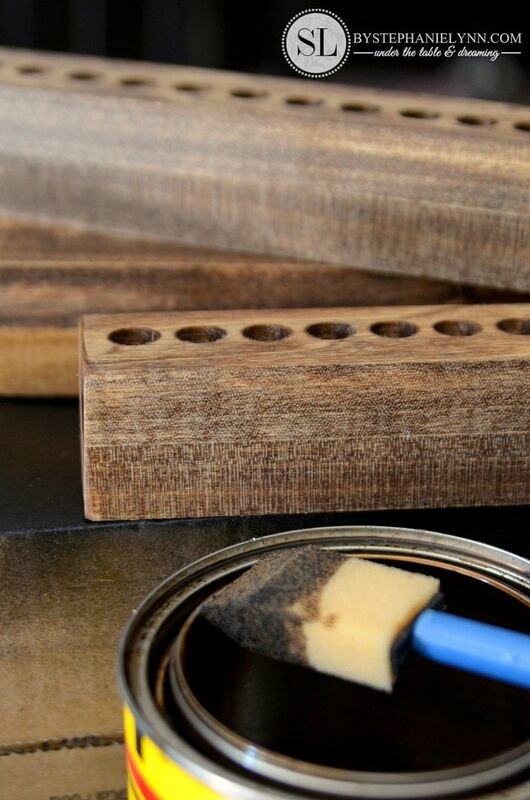 The dried wood glue (used in the next step) will prevent stain from penetrating the wood if the holder is assembled first. 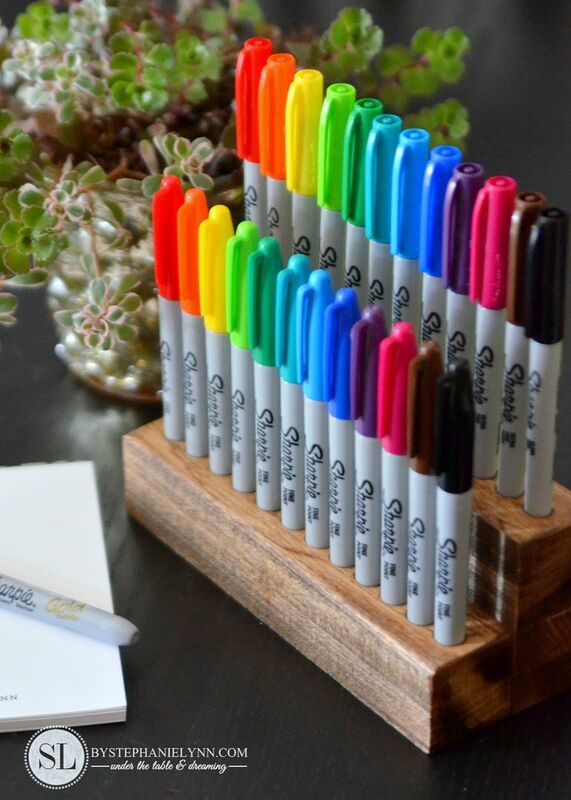 Step Six: Assemble the pieces to create the Wooden Sharpie Holder. 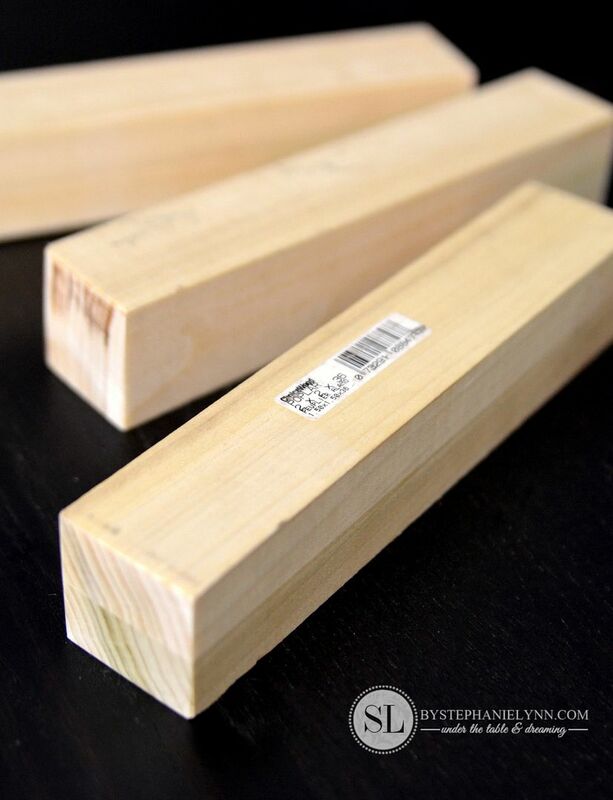 Use wood glue between each piece of poplar and clamp together, as shown above. Allow the glue to set and dry for the manufactures recommended time. Step Seven: Add the Sharpies. Next is the fun part – the Sharpies! 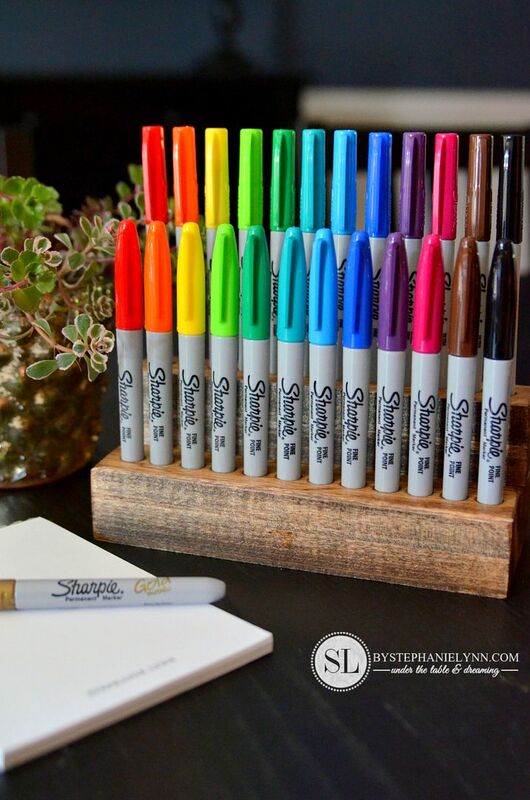 I’m normally not much for having a lot on my desk…but I just love this colorful display! CJ is quite fond of the rainbow display too – he loves the process of taking them all out and putting them all back in – while singing the Rainbow Colors Song. 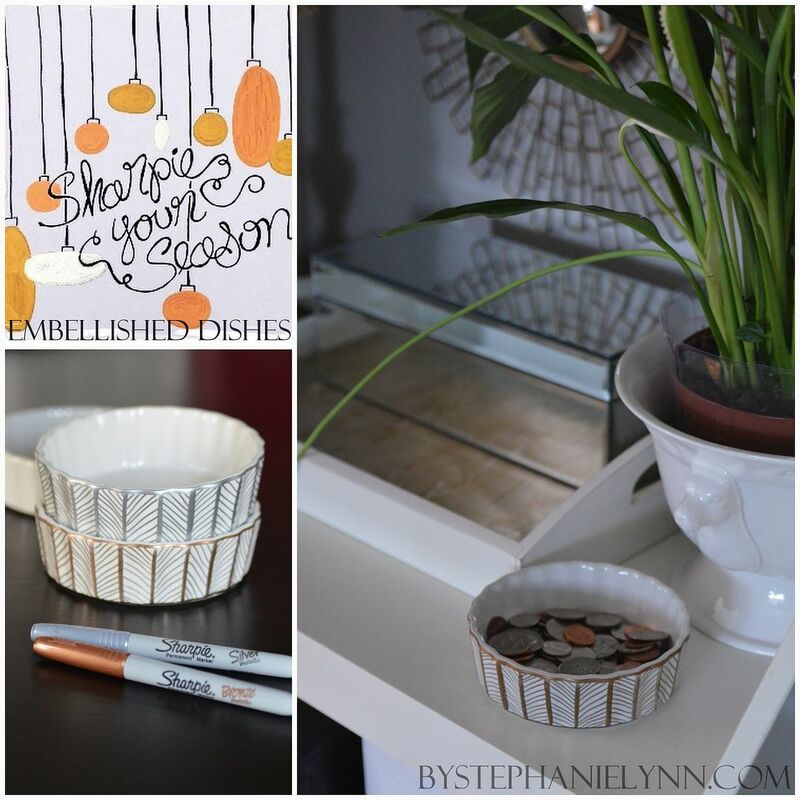 This is beautiful and so simple to make. Now I want one. 🙂 Thank you for sharing. I love this! It does look fun. 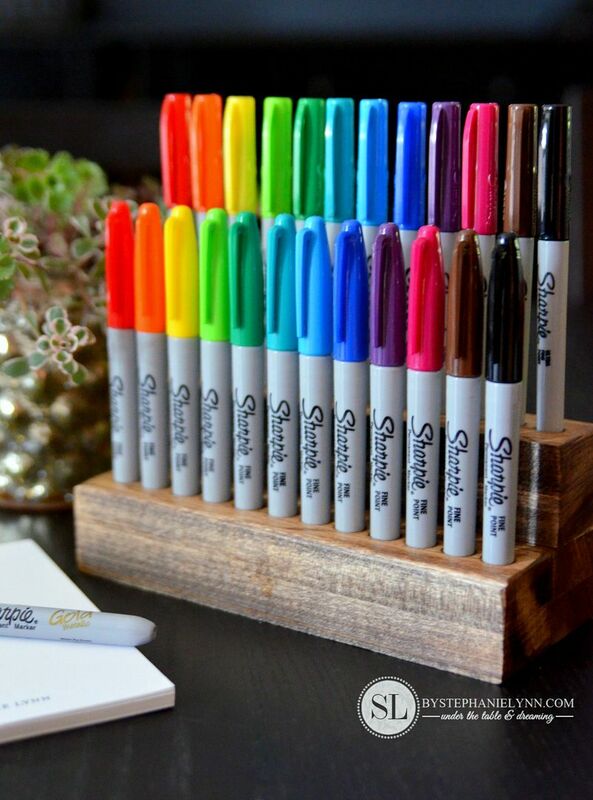 My (teenage) daughter would LOVE this, she’s a Sharpie freak! 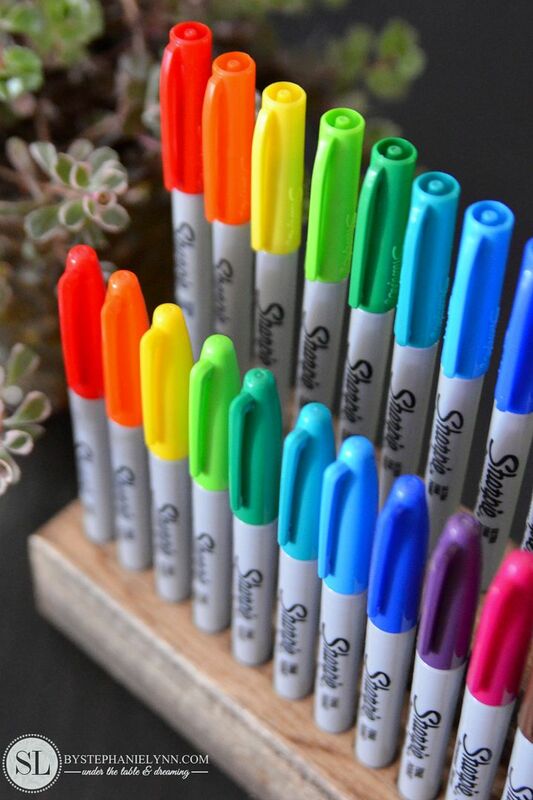 I love seeing coloured pens in a row like this, in rainbow order. When I was little I had a pack of felt pens in my Christmas stocking every year and used to love keeping them in the packet in the right order for as long as I could. Takes me back!